After lunch we ran several errands. I have mentioned this before but I LOVE running errands and it all stems from the fact that it is something my mom and I always did/do together. Things as simple as going to the cleaners or picking up a bag of ice are an adventure when we are together. After our errands we went to the movies to see The Big Wedding. It has an all star cast, and although I had doubts, it was really funny. I definitely suggest it for a good laugh! On a side note, we were two of six people in the theater. Love going to the movies when the rest of the world is at work. 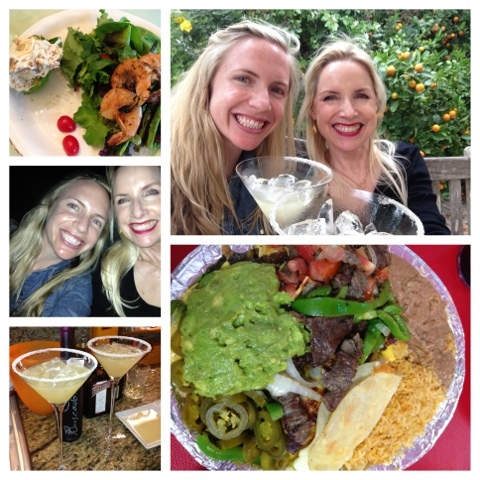 After the movies my Momma and I decided we wanted to make some of her delicious margaritas! I have posted the recipe before and it can be found here BEST MARGARITA EVER. We sipped our delicious cocktails on the back porch and enjoyed the fabulous weather. Later that night we went to Rositas for a Botana platter. I always have to stop at Rositas when I am home. Since before I can remember, my Momma and I have always had high tea in the afternoon. This visit was no different, and we invited her friend Jamie to join us. We sipped champagne (and some tea too) and feasted on a delectable creme brulee. I have never had creme brulee that was in a crust. This one was, and it is my new favorite dessert. It was sooooo good. The crust gave the delicate custard more texture and decadence. I loved it every bite. 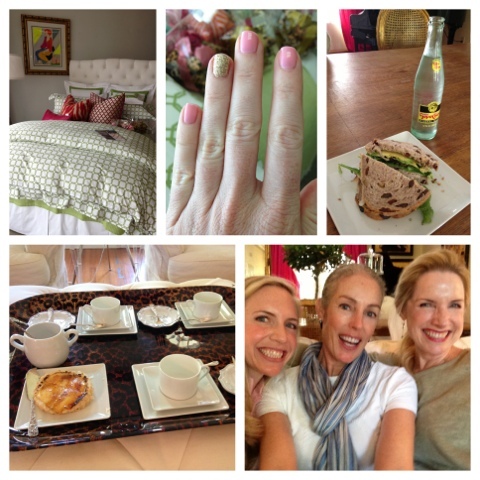 One of the beds in my mom's store, my trending manicure, a yummy sandwich and a Topo-chico water (a Texas obsession of mine), High Tea Tray, and the Ladies who Do Tea time! After Tea Time it was Happy Hour. We switched from Champagne to Wine, visited with our neighbors Scott and Denise, and then grilled succulent steaks. It was the perfect evening! 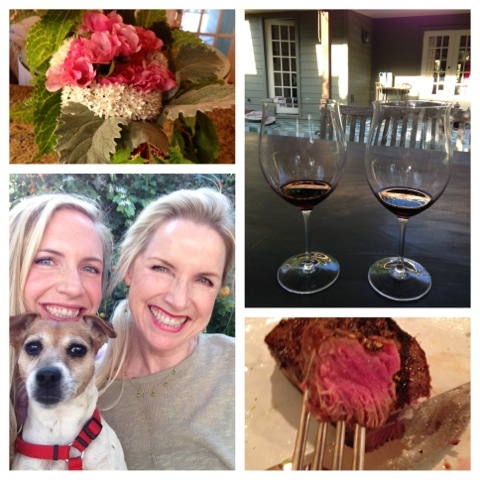 Gorgeous flowers from Scott & Denise's garden, Happy Hour with Jackie, Red Wine with some perfectly cooked steak!